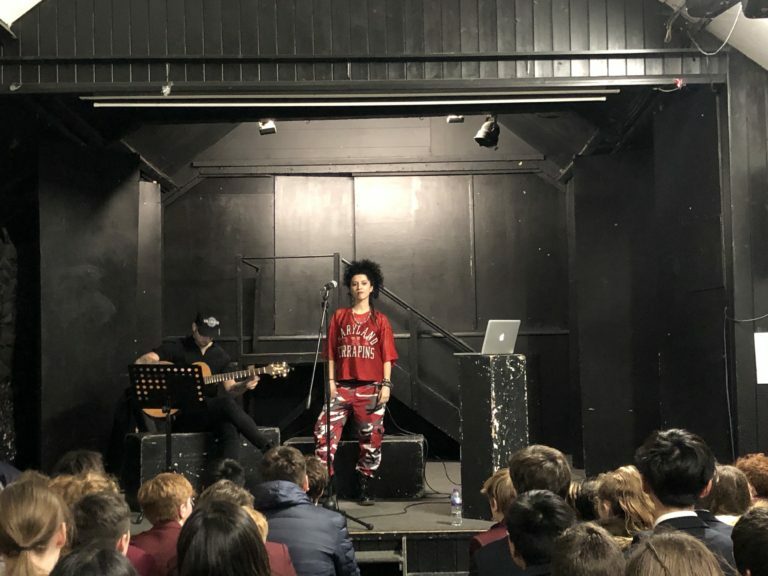 On Friday 8th February Y7-11s had the privilege to hear upcoming singer, Izzy Thomas, as part of her Mental Health, Online Safety & Cyber Bullying themed school tour. The main message of Izzy’s presentation was to empower students to make the right choices in regards to Online Safety & Cyber Bullying, as well as to inform students not to discriminate and to treat everyone fairly. They also discussed mental health and well-being, empowering students with confidence to speak about their state of mind, tools to recognise when to reach out and who to talk to. After having their own issues with online safety, stress and mental health, Izzy and her guitarist wanted to discuss these issues with the younger generation. She ended on her new single ‘Trouble’ which is released next week. Uk artist Izzy Thomas flaunts a fresh sound of Alternative Pop/Rock, blended by power house blues vocals, with a fusion of punchy urban beats. Izzy has left her mark in venues around the world, gracing iconic stages from the Birmingham Arena & o2 arena supporting Placebo & Bryan Adams on tour. As well as receiving forms of online bullying, Izzy has also struggled with her own mental health issues and her brother is also autistic so is in the perfect position to discuss these important issues with youngsters.